I am posting this here to see if anyone has any information for why this is happening. Also, to bring this to other people's attention in case I am not the only one. Essentially DIM has decided to start installing software in sub directories of it's own choosing. If you look at the attached screen shot you will see what I mean. I've annotated the image to better explain what has been going on. To make a long story relatively short, I went to finally install Carrara this morning. First I double checked that my install directory was clean, which it was. I opened up DIM, double checked that my application path was pointing to the right place. Which it was. I then started the installation. I still had the intended install directory open and noticed that it wasn't being populated as the installation proceeded. When it was done, the installation directory was still mostly empty. I went back into the Application settings in DIM and discovered that it had installed to a different place. A sub directory under my DAZ Studio installation, application entries that were not there previously. That's when I also discovered that DAZ Studio itself now had extra application areas that I never created (and didn't notice when I was there before). Suddenly a litany of errors I was having now make sense. Things like shaders and lights not working and files not being found. Anyone have any idea how I can fix this without having to reinstall everything? And how do I keep it from happening again? DIM is a cluster on it's best day, but I found installing on my system drive in the respective folders Program Files, Program Files (x86) or on Mac the Macintosh HD:Applications tend to be a little less confusing to DIM, but that's an observation not a fact. The only way I can get DIM to not make me want to put my fist through my LCD is to use it, quit out of it and open it back up when I need to use what I loaded for in the first place. DIM has not added any enjoyment to my 3D experience but it does not appear to be backing down as Daz3d's exclusive means of installing their software and content. DIM does not install to any path contained in the Applications tab, but to the selected path as listed in the Installation tab. In other words, you need to set up the path that you want your content installed to FIRST in the Installation tab, select that, then choose to install the program. The Applications tab is used mainly for installing plugins, and is used to let DIM know where applications like Carrara or Photoshop or ZBrush or DAZ Studio are located. I understand your frustration and I echo it. I have an open support ticket from the beginning of August concerning other DIM errors. For those issues I have been alternately ignored or given ridiculous answers ("Have you accepted the EULA?"). Now I am wondering if those errors are related to this latest cluster. Unfortunately I think I am forced to use it just to try and install the number of products I have purchased. That plus keeping them up to date. None of the program files were installed there. Only the additional content that I had tagged for installation. Do you have H:\Carrara_8.5.0.204_Win64 listed as a path in the Installation tab of the DIM, and did you select that to install your program? If you want to install content somewhere else, then you need to set up a path to that folder and select it before installing. I had this with Carrara (there is another post somewhere on the forums). Programs/Applications install to the location specified by the 32- or 64-bit Application setting. Then, any additional paths the install process wants to add on (such as with Daz Studio adding two levels of folders) will be appended. If memory serves it was on about the 5th install/uninstall cycle I actually got things working (for Carrara only, sadly) and DIM now believes that I have Cararra installed where I want it. Set the 32- or 64-bit application to the base folder where you want it installed (I think a folder named Carrara is automatically added, so you may need to experiment). Re-check the install paths and see what is there. Check where the application was installed. Modify (you may need to delete and re-add) the install path created to point to where Carrara is. You can now modify the 32- or 64-bit app path back to what it was. No guarantees of the correctness of this, but it seems to work for me. I almost certainly, 100% sure, that I had H:\Carrara Content\DIM selected. I know this for a fact because I still have DIM up from when I did my installation and discovered the problem. Thank you for the assistance. I am going to have to wait until I have a wired connection to do this, since now I have to redownload everything. And Wi-fi is never a good idea for that. I have (another) Support Ticket open as well so maybe there is another answer to be gotten as well. If I do hear something useful, I will let you know. If you don't have Show Details checked in the main window and select for example a Bryce content item it will be installed into the last content path you had selected. If you have Show Details checked you will see where it will install the files. Also, if you change updated from Respected "Installed" Path it will do just that. I always have the Show Details open, it just wasn't showing on the previous screen grab because that was the "Installed" tab. However, in grabbing this screen, I noticed the 4th line down in the details: "64 bit Software..."
That was when I realized what Jimmy was trying to say earlier, but the whole thing still doesn't make any sense. Why would DIM install once to the directory listed in Applications, but then install updates to another directory? For example, if you look at the latest screen shot, Bryce was installed thru DIM to H:\Bryce_7.1.0.109_Win32. And when I check that directory, it's populated. That is the same for DS32 and Hexagon. Both installed thru DIM and installed to the directories listed. However, DS64 now resides in both H:\DAZStudio_4.6.0.18_Win64 (the directory I specified in Applications) and H:\DAZStudio_4.6.0.18_Win64\DAZ 3D\DAZStudio4 (the directory that DIM decided on). Furthermore, Carrara Beta 8.5 was installed to H:\Carrara_8.5.0.204_Win64 before I uninstalled in in preparation for installing the Pro version. The package installed to H:\DAZStudio_4.6.0.18_Win64\DAZ 3D\Carrara8.5. Before you added you own directories for DS and Carrara, did you remove the ones that DIM had set up, did you change the ones DIM had setup or did you just create new ones? And do you get content to the right spot? DIM had not set up any directories when I entered the directories I wanted. When I entered the Application directories, that entire window was blank. I did not install any other Carrara content other than the Native Content, the Native Pro Content, and (accidentally) the Hair Caps. All I know is that on Mac OS X Carrara is a little special as content goes "into" the application bundle and thats why you cannot really control that as a user or your content will be useless, but how it works in Windows I don't know. Technical Support has been absolutely useless as they can't even answer my question from August. So this current debacle is made worse in that DIM throws a UNKNOWN_ERROR every third or fourth install package. Resulting in having to shutdown, reboot and try again. And now it looks like I will need to reinstall everything. 1. DIM does not like it if you manually install an application and then attempt to "update" it with DIM. * In other words, if you install DS manually through an installer, do not attempt to update with DIM. If you do, DIM will ignore the original installation and create a brand new installation. Usually nested in a directory where you do not want it. 2. Stay on one path and do not change mid-stream. * For example, if you have manually installed Carrara and then decide you want to let DIM handle the Carrara updates, uninstall Carrara and allow DIM to handle the installation from ground up. This includes reinstalling all the plug ins / additional software you may have installed to the manually installed location. I decided to write up a "proper" installation / set up procedure for dealing with these DIM issues. But I am by no means an expert, just someone who got extremely frustrated with all the errors I was receiving. So here is where things get a little dicey and I am hoping others can point out anywhere I might have gone astray. Hopefully this isn't already written up somewhere and I am not wasting my time. I know I wasn't able to locate any useful information when all my DIM related troubles began. 1. If you are not starting from a clean machine, then uninstall everything. That means uninstalling DS, Carrara, DIM, CMS, etc. No need to uninstall things like Bryce, Poser or Photoshop as DIM does not handle these packages. Admittedly this is a headache, but it's easier than getting a month down the line and having to start over. 2. Install DIM. I made it a point to download a new copy and install it fresh. This process should also install CMS. Regardless of your affinity for CMS, I would leave it installed until the end of this process. 3. Configure DIM. This is where things start to get complicated, so I am going to take it in sub-steps. b. Downloads. Set the directory you want your download files to go to. If you want, set the filters here as well. c. Installation. Set the base directories for where you want your 32 bit and 64 bit software to go. Be mindful that this is in reverse logical order with 64 bit above 32 bit (I made this mistake during one of my trial runs). Also be aware that DIM will create subdirectories under this directory. I believe the naming convention is "X://DAZ/" with the software package directory following. d. Installation. Check your options. If you want Short Cuts created and where, where Updates should go. e. Installation. Assign a single installation directory for the moment. This will be the directory the Default content will go. You can subdivide and classify this later if necessary. f. Applications. Add only the locations of software DIM will not handle; i.e. Photoshop, Poser, etc. Personally I would not make any changes here until the basic installation is completed. 4. 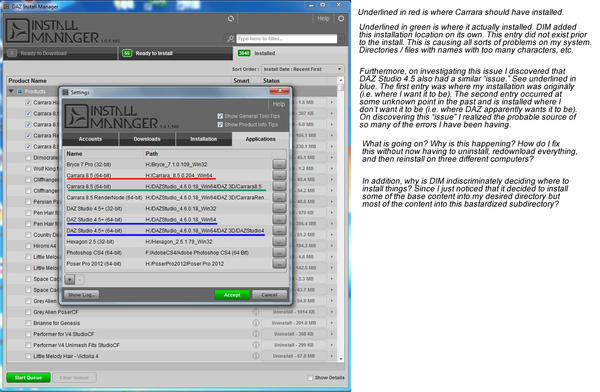 Download and Install DAZ Studio and / or Carrara through the DIM interface. At this point in time I would install only the "Base" packages, no Genesis content packages or Default content. Make sure the "Default" directory is selected in "Content Path Shortcuts." 5. When the installation process is complete, flip back to the Applications tab and confirm that DIM has now added the install paths to the new software. Now you should be safe to start adding additional Content Path locations and installing the Default packages and such.